The logo from NASA's short video "The Edge of Tomorrow," which references an episode of the original "Star Trek" TV series. The video explains how the International Space Station is making it possible for humans to travel farther into space. "Star Trek" shows a universe where people can warp out to nearby stars and visit many worlds that are similar to Earth. While humans in the real world are much more limited in their options for space travel, NASA said that the International Space Station (ISS) is paving the way for a future where humans can reach farther out into the universe. 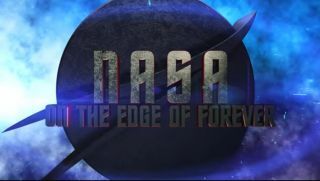 Last Friday (July 22), the administration released a new video called "NASA: On The Edge of Forever," referring to the name of an episode of "Star Trek: The Original Series." The video was released on the same day that the newest installment to the Trek movie universe, "Star Trek Beyond," hit theaters across North America. "For most of us, the thought of traveling to another galaxy probably seems like science fiction," NASA astronaut Victor Glover said in the video. Glover was selected in 2013 and hasn’t flown in space yet. "But the truth is, the foundation for humankind's journey beyond Earth's solar system is being laid right now aboard our very own International Space Station." Experiments in microgravity (or weightlessness) are helping pave the way for human missions to Mars, and perhaps other space destinations, according to NASA. "In the original 'Star Trek' TV series, space stations served as deep-space research laboratories, as well as rendezvous points where starships could dock before exploring the unknown," Glover said. "When we were envisioning our own space station, the applications were similar." The real space station serves as a test bed for developing microgravity technologies (such as 3D printers and coffee machines), and astronaut health techniques (such as effective exercise regimes and growing fresh food). Currently, NASA is aiming for a human mission to Mars, which would require crews to spend more than a year in space — much farther away from the resources of Earth than crews on the space station — so these technologies will be even more crucial for keeping crew members happy and healthy. "When you remove the force of gravity from your body, you will lose things like muscle mass, bone density. Your heart doesn't have to work as hard," Jeanette Epps, an unflown member of the 2013 NASA astronaut class, said in the video. Another problem that arises from living in microgravity (though it is not brought up in the video) is vision changes from long-term stays in space that, in many cases, are permanent. "But thanks to the International Space Station, we're able to study the effects of weightlessness and develop countermeasures in orbit, close to Earth," Glover said. On average, astronauts spend roughly 90 minutes to 2 hours every day lifting weights or running on the treadmill to slow muscle and bone deterioration. To help with psychological health, NASA also gives astronauts regular free time and chats with loved ones by video. The long-term effects of life in space were recently put to the test when two station crewmembers, NASA astronaut Scott Kelly and Russian cosmonaut Mikhail Kornienko, both spent an entire year on board. Modern space exploration may not look exactly like it does in "Star Trek," but many people feel that humans will inevitably push out to more and more distant locations in the universe. "I think it's in our evolutionary creed that we have a manifest destiny to go into space and to find new worlds to live in," said "Star Trek" actor Walter Koenig (who played Pavel Chekov on the original series) in the video. Added Epps: "So every step we take, we're just getting further and further into space and becoming more and more like 'Star Trek.'"